The traditional doctor-patient relationship has always relied upon an initial face to face consultation , to initiate the association . This has a lot of advantages, but it has lots of problems as well. Patients have to travel to see their doctor, and this can be very time-consuming with today’s traffic jams. They have to wait in the clinic ; and the doctor may be stuck in an emergency at that time, as a result of which he is running late ; or may not even be able to see the patient as scheduled . This creates a lot of inconvenience for the patient . 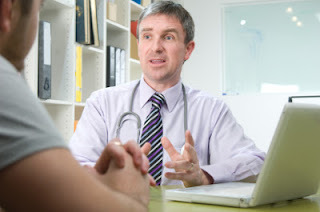 Also , a face-to-face consultation is not necessarily the best way of exchanging information with the doctor. He may be in a bad mood because he may have run into a complication , as a result of which he may be short tempered . He may end up using a lot of jargon and may not explain things well because he is short of time and has lots of other patients to see. In addition, it’s well documented that patients forget half of what the doctor tells them , because of the stress of the consultation. helpful ? Can he trust the doctor ? A face-to-face consultation allows the patient to judge the doctor’s bedside manner firsthand, so he can assess whether the chemistry between the doctor and him is good; and whether they will be able to establish a productive partnership. However, because of the time and expense involved in doing these consultations , we need to start looking for alternative measures. One way is to do virtual consultations using videoconferencing and these have become increasingly popular. However, consultations serve two different purposes. One is to meet the information needs of the patient, where the doctor makes a diagnosis ; and formulates a treatment plan . An equally important ( but often neglected ) function is to meet the emotional needs of the patient , so he can decide if he is comfortable with the doctor and is happy working with him. A good consultation addresses both these needs; and while both are equally important , they are slightly different , and are best met with different tools . It’s now possible to use a mix-and-match of tools , so that both doctors and patients are happy with each other. Thus, the information needs can be best met through online patient education using a website or e-mail ; while consultations are best for meeting the emotional needs. These could be done by videoconferencing ; or a face-to-face consultation. However, some of these services could be misused. For example , patients could send lots of e-mails to doctors without actually intending to take treatment from them ; and lots of doctors may get irritated by this, because it consumes their time , and is not a service for which they receive any income. This is a great opportunity for clever entrepreneurs to think of new and more efficient ways of connecting doctors and patients, which doesn't eat into the doctor’s time, but can increase the level of trust and confidence which the patient has in the doctor.